John McCain was born on Aug. 29, 1936 and died on Aug. 25, 2018. He served in the U.S. Senate from 1987-2018. Senator John McCain died from brain cancer on Aug. 25 and left a lasting impact on politics. Junior Erin Magoffie spent the summer of 2017 learning from John McCain and his senate office in Arizona. 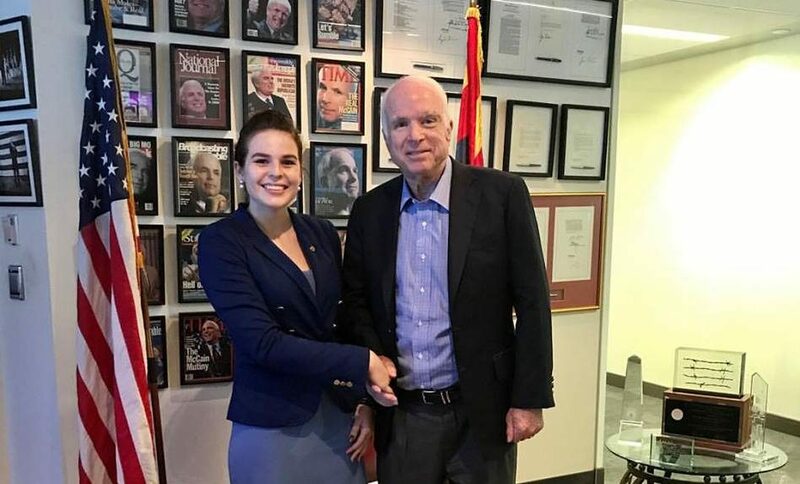 Magoffie, who studies political science at Simpson, interned for McCain and spent her summer answering phone calls, going through mail and performing other tasks. She described her work as being highly specific and having many protocols in place to prevent interns and others on staff from speaking on behalf of McCain or his office. She even had the chance to meet McCain twice. The first time she met him as he was passing through the office unexpectedly. Magoffie worked in the office during the time McCain was diagnosed with brain cancer. She said he could have stepped down from the U.S. Senate to focus on treatment and spend time from his family, but he was dedicated to his work. Magoffie was devastated when she learned of McCain’s diagnosis but was moved by his dedication to his constituents. She said he worked as long as he could because he owed it to the people who elected him to office. On Aug. 24, McCain announced he decided to discontinue cancer treatment. His staff and office understood this decision, although Magoffie wanted him to get treatment. The staff was also aware that McCain wasn’t flying to D.C. as frequently. “I wasn’t too shocked mostly because, I figure, he (had) treatment for a year and a little bit. I figured at that point maybe you’re just tired of receiving treatment. I know that it was making him kind of sick,” Magoffie said. The news of McCain discontinuing treatment and the news of his passing occurred within one day of each other. Magoffie wonders if McCain made the decision earlier than when it was released to the media. Many politicians and others spoke out on McCain’s passing to support his family and remember his legacy. Politicians from Barack Obama, Joe Biden and George W. Bush attended the funeral on Sept. 1. McCain will be remembered by Magoffie as an incredible role model and politician who owed it to his people to serve them well.